I recently had lunch with an old friend who is also the pastor of a large (in UK terms) church – 600 members, grown pretty much from scratch. I was hungry for my Thai curry, but hungrier to learn. As we mulled over various things, he sketched out some of the basic maps he uses to plot the ministry structure of the church, and how he fits into a large church with a large staff. One of them was a basic, four-square grid. You’ll need a couple of definitions so you can make sense of the diagram. 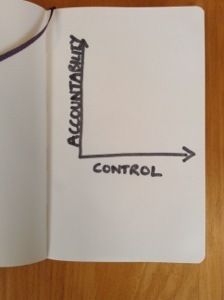 Accountability means being held accountable to the vision, values and culture of the church. What you’re doing expresses the church’s DNA. Control means being tightly managed by someone. There’s little room for error or individuality, because details matter. As my friend talked on, two conclusions became clear. First, pastors seem to have an innate tendency to put everything in that top right hand box. If we are being kind to ourselves, it’s because we’re dealing with the gospel, everything connects to the gospel, and therefore everything matters. The alternative would be to allow in a false gospel, which would would wreck everything. That all being true, I think there’s still a difference between saying ‘We need to watch ourselves doctrinally’, and saying, ‘I am the only person I trust to do that.’ Really? You trust everyone else that little? And you trust yourself that much? Perhaps we should ask some hard questions about just how highly we value ourselves. Second, – and this was a real shock – my friend insisted that the small groups in his church go in the top left box: there is low control but high accountability. They have a huge amount of freedom over what they study (although there are resources provided centrally if they need them), but they are tightly accountable over their attitude to studying the Bible together. Why they learn together is much more important than what they learn together. He insists this isn’t abdicating, because he has rebuked and disciplined at least one group for their patterns and conclusions which violated the church’s values. So the exercise from his diagram is a double challenge. First, sketch out those four squares and see where most things in your church tend to fall. Is the right-hand ‘controlled’ side the diagram over-populated? Is that top-right square over populated? Do you have anything at all in the top left square? And what absolutely must remain highly accountable and highly controlled? And second, what do you you think of my friend’s determination to keep the small groups highly accountable but loosely controlled? As usual, pile in with your comments below. Thanks Chris, another diagram (Ever)noted! 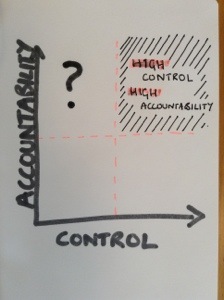 I’d be happy with the low control / high accountability for small groups…if, as described, that means there’s solid effective channels between the leadership and groups so problems can be addressed. It sounds like, by control, you’re largely talking about content. I think there’s something great about a group hungry to study the bible together deciding what they want to study. And of course, there’s the provided material if needed. If by low control that means no clear leader of the group and no regular relationship between the leader and the staff team then I’d worry, but from what you’ve described that’s classified more under accountability. I guess I would be looking to synchronise the groups at particular times when it’d benefit the whole church to be on given topic – like Lent, to give an Anglican example. We turn small groups into open lent groups for four weeks to give people who aren’t in a small group a road in and it helps to have everyone on the same material for that. Thanks, Dan. Yes – part of the high accountability is the strong, two way relationships that produce the level of trust necessary. I think my friend would be happier with some flakier content occasionally, because they are a consequence of having taken a risk to trust someone. I guess what this re-highlights for me is the uncomfortable bottom left corner. Those ministries where we have low control and where there is low accountability. As I look at what they are, they fall into two categories (1) they tend to be the things that exist for their own sake because they have a historical heritage of having existed for many years and the prospect of changing/sharpening them up is next to impossible for a multitude of reasons! The second category is perhaps more uncomfortable, those ministries which may well be newish – but have vision-less ‘leadership’, and again a resistance to change and so personal detachment for them has set in. This type of exercise has reinforced for me the need to run a leadership course for those involved in ministry. Something which we’re planing to do this term. Thanks, Chris – it also raises the uncomfortable idea that we might be doing stuff that no-one really cares about or sees the point of. So the point of the post was probably not that I spend 5 minutes of sermon prep time trying to guess which pastor you were having lunch with…? Re home groups one question on control is membership. Free for all choose your own or allocated by leaders. Did your friend have a view on this. Maturity must play a role as well. With individuals control starts higher. i am more likely to meet with a new preacher before hand to go through the sermon than with a seasoned speaker but they must still brought accountable. Does that read across to groups. New group sometimes means higher control.